The fiber-glass model. Excellence helmet for long distance riders. Vents and spoiler for great ventilation In any helmet position on the bike. Visor with lock system mechanism. Anti-scratch visor with fast removing system. Includes pinlock original and inner linning anatomical for a better commodity and comfort and washable. 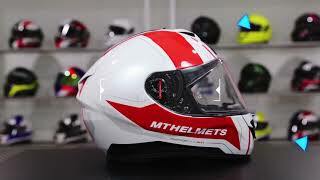 MT HELMETS has been approved by the most demanding international homologations. DOT CERTIFIED(USA), ECE/ONU 22.05.P (EU) and SNELL USA (USA) cover the most challenging US and European homologation standards. We have also been granted with the NTC 4533 (Colombia) and NBR7471 (Brazil). These homologations are only granted when every single component of the helmets has duly passed an established and exhausted security examination. Improved 100% Max Vision Pinlock ready.